Single storey extension to rear and dormer to front and rear at 7 Belgrave Avenue, Halifax. Fell two trees (Tree Preservation Order) at 2 Ryecroft Close, Lightcliffe, Brighouse. Works to listed building including removal of modern internal partitions and walls, installation of under floor heating. Externally, repointing works and removal of concrete access ramp. (Listed Building Consent) Roebucks Farm, Danny Lane, Luddenden Foot, Sowerby Bridge. Two storey side extension at 10 Coronation Terrace, Ripponden, Sowerby Bridge. Two storey extension to East elevation at 12 Queens Drive, Southowram. Prune three trees, fell one tree and remove saplings (Tree Preservation Order) at 2 Blackbrook Court, Brighouse. Singler storey extension and raised patio to rear at 3 Broad Carr, Holywell Green, Elland. Prune two trees (Tree Preservation Order) at 12 Brodley Close, Hipperholme, Brighouse. Fell one tree (Tree Preservation Order) at 7 Brookwater Close, Halifax. Demolition of existing storage shed to facilitate two storey side extension and detached car-port. Handcroft Farm, Bottomley Lane, Barkisland, Sowerby Bridge. New bin store, meter housing and extraction fan air input. New terraced area to include timber frame with retractable canopies, up/down lights, lighting bollards, heaters, new entrance door and illuminated planters. (Listed Building Consent) The Moorings Pub and Kitchen, The Moorings, Sowerby Bridge. First floor extension to rear at 4 Lumbrook Close, Shelf. Detached garage at garages and land at Walsden Goods Yard, Rochdale Road, Todmorden. Conversion of integral garage to living space at 110 Bacup Road, Todmorden. Installation of flue to north elevation (Listed Building Consent) at 1 Whitehall Fold, Townfield Lane, Heptonstall, Hebden Bridge. Creation of new end terraced property (Outline) at 14 Woodlands Avenue, Halifax. Porch to front and conservatory to rear at 10 Harley Wood, Todmorden. Demolition of rear section of former theatre and construction of 37 space extension to existing surface level carpark. Conversion of remaining front section into three flats with ground floor cafe/restaurant (A3) (Listed Building Consent) The Theatre, 1A Wards End, Halifax. Proposed Bungalow at 62 Broomfield Avenue, Skircoat Green, Halifax. Stable block on land north east of West End Farm, Flower Scar Road, Todmorden. Illuminated and non illuminated signage to front and side (Advertisement Consent) at 17A Wakefield Road, Lightcliffe, Brighouse. Conversion of barn to dwelling-house including demolition of lean-to extensionsat Hill House Farm, Barn Raw Lane, Mytholmroyd, Hebden Bridge. Submission of information to discharge conditions on application at 56 Caldene Avenue, Mytholmroyd, Hebden Bridge. Non material amendment to application to increase in number of children cared for at any one time from 67 to 98 at Greenglades, Denholme Gate Road, Hipperholme, Brighouse. Conversion of garage to living space at 2 Heatherdale Close, Wheatley, Halifax. 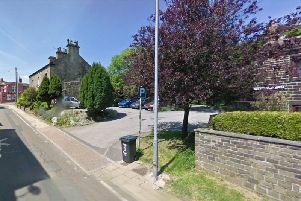 Submission of information to discharge conditions on application - conditions 1 and 5 - regarding land opposite Birds Royd Works, Birds Royd Lane, Brighouse. Two storey and single storey rear extensions at 31 Whitley Drive, Illingworth, Halifax. Prune tree (Tree Preservation Order) at 32 Ewood Lane, Todmorden. Demolition of existing conservatory to rear to facilitate single storey extension at 37 Meadow Lane, Wheatley, Halifax. Removal of existing signs. Installation of one illuminated projection sign. two illuminated fascia signs, three poster cases and replacement floodlights. (Listed Building Consent) Wellington Inn, Southgate, Elland. Internally illuminated fascia sign at 223 King Cross Road, Halifax. New shopfront (Retrospective) at 223 King Cross Road, Halifax. Dwelling (Retrospective) at Rosedale, Beechwood Road, Holmfield, Halifax. Remodelling ground floor to create granny flat using area from garage and covered patio at Greenways, 34 Leyburn Avenue, Hipperholme. Dormer to front at 1 George Street, Elland. Prune one tree (Tree Preservation Order) at 10 Brodley Close, Hipperholme, Brighouse. Submission of information to discharge conditions on application - conditions 2, 3 and 4 - at 8 Church Street, Heptonstall, Hebden Bridge. Residential development of four dwellings (Outline) on land off Townfield Lane, Heptonstall, Hebden Bridge. Replacement windows (Listed Building Consent) at 2 Hebble End, Hebden Bridge. Installation of flue (Listed Building Consent) at Hipperholme Farm, Eastwood Lane, Todmorden. Demolition of existing kitchen extension and rebuilding new single storey kitchen incorporating a WC for accessibility purposes at 15 Cromwell Terrace, Halifax.